This is positive news because it means that the the socio-economic impacts from electrical transmission projects, an omission in the current process for which we have long argued, will now be the subject of research with the learning applied to future projects in Scotland, and potentially further afield. 21.10.16 Article and SPEN advert in the Galloway News: This week’s Galloway News included an advert asking for views on their plans and a short article about the Kendoon to Tongland route. 18.10.16 Scottish Power has published their preferred route from Kendoon to Tongland: Scottish Power Energy Networks has published the preferred route for the Kendoon to Tongland pylon line on their website. Local residents should receive a leaflet through the post with full routeing. The consultation document is available on line and in local libraries. You can see the route here and the leaflet here. The routeing and consultation documents can be seen here and the map here. The last date for responses is 13 January 2017. 23.09.16 Meeting with Scottish Power Energy Networks. Members of DGAP recently met with SPEN. There were several interesting points from the meeting including a clarification (despite a recent weaker statement from the Statutory Stakeholder Liaison Group) that “they do not expect to be re-visiting the Dumfries and Galloway Strategic Reinforcement project”. There was also a little more information about the Kendoon to Tongland line. You can read the notes from the meeting here. 04.09.16 Electricity Transmission Planning in the 21st Century When we met Ofgem recently we presented a paper that summarises some of the main points learned from the our work on the DG Strategic Reinforcement project and matters that need to be considered in any future project of this kind. You can read a copy of the paper here. It transpires that recent research from the Carnegie Trust UK titled: “The Enabling State in Practice: Evidence from Innovators” includes similar arguments and suggests that the state needs to play a more facilitative and enabling role to empower individuals and communities to have more control to improve their wellbeing. 30.08.16 The “Statutory Stakeholder Liaison Group” met recently. This is the group of organisations with an interest in this project (such as SNH, SEPA and D & G Council – but not us) that meets periodically with representatives from SPEN to discuss the project. You can read the minutes here. 31.07.16: Meeting with Scottish Power Energy Networks: Members of the DGAP committee met senior managers from Scottish Power Energy Networks to discuss the whole Dumfries and Galloway Strategic Reinforcement project, the reduced plans, the consultation process and the plans for the Kendoon to Tongland route. You can read the notes from the meeting here. 28.07.16 Scottish Affairs Select Committee Report: The SASC has reported on the renewable energy policy. You can read the report here. This is mainly of interest because it is the development of renewables, particularly on-shore wind, that is stimulating the need for uprating the existing transmission infrastructure. You will find the most relevant content around pages 42 – 44. 15.07.16 SPEN Conclusions Report Published: Scottish Power has published its summary report of consultation. You can read the Executive Summary here. Go to the project website to see all of the details and information about where you can see hard copies. There is a lot of information but we at DGAP have already started to study this. 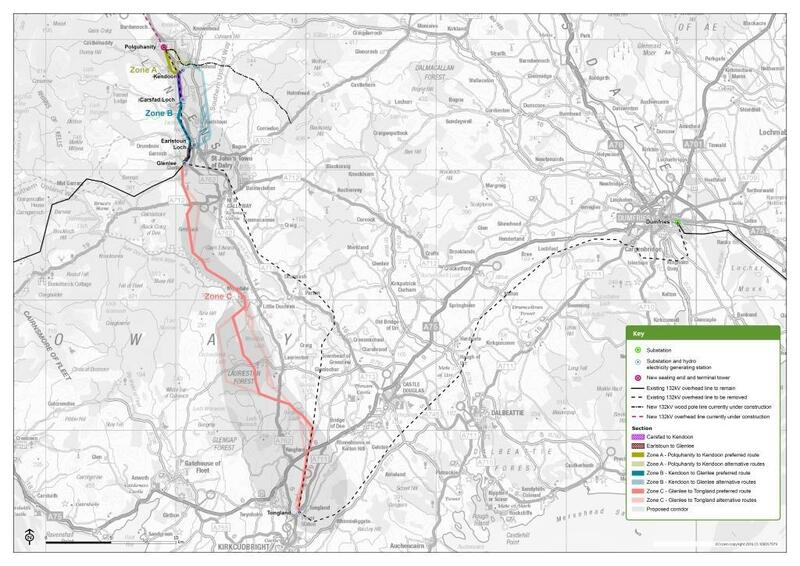 One of the main issues that still remains is the proposed new route of the Kendoon to Tongland line. This is to the west of Lock Ken (the existing line is to the east of the loch). You can see the proposed line here or on page 129 of the report (it is the same “corridor” that was originally proposed but wider near Mossdale to Lauriston). DGAP is looking at this particularly closely. 13.07.16 In the Press: There was an article in the Daily Record about the revised plans. 12.07.16 What a Relief! : Many DGAP members and supporters have been in touch to express joy, delight, gratitude and relief at the Scottish Power change of plan. We have gathered a range of comments here. Despite the euphoria, we are still concerned about the proposed line from Kendoon to Tongland so are continuing the consider the issues relating to that. 11.07.16 Supportive Comments: We greatly appreciate the many kind comments over the past few days from DGAP supporters. Thank you! This one was in a statement from Fin Carson MSP. “That these concerns were raised is in no small part down to the hard work of the action group, ‘Dumgal Against Pylons’ who put their case forward so eloquently.” You can read his full statement here. 08.07.16 SPEN’s Map: Here is the map of the changed route. 08.07.16 SPEN Announces their revised plan: A press release below has been issued by Scottish Power today. In summary, they do not intend to go ahead with the original plans for 50m tall pylons and huge substations across the region! We always accepted that there would be a need for some changes to the existing infrastructure and, indeed, they are proposing some. So we will need to keep a close eye on these. But, for the moment, let’s celebrate an amazing result! Following a comprehensive review of the proposed Dumfries and Galloway Strategic Reinforcement project, SP Energy Networks has submitted revised proposals to Ofgem, ahead of plans for another round of public consultation in the autumn. The updated submission has determined that a ‘Reduced Scheme’ consisting of new 132kV transmission infrastructure between Kendoon and Tongland is now the most favourable option, after the detailed review determined that the full 400kV Auchencrosh to Harker proposal is now not cost effective. The proposed corridors for the new infrastructure will consist of approximately 46km of new towers, with a height of around 30m. As part of the proposals, 89km of existing 132kV towers with a height of around 25m will be permanently removed. The submission follows an extensive consultation exercise in 2015 that involved some 1600 responses. SP Energy Networks then undertook a further review of its proposals, which included analysing the impact of UK Government changes to subsidy arrangements for onshore windfarms. This review also considered the future mix of power generation in Scotland and plans for the development of the wider electricity transmission network. There remains a need to modernise the existing transmission network and connect new generation. Currently there is 339MW of embedded renewable generation connected to the system in Dumfries and Galloway with another 205MW contracted to connect in the future. The revised submission to Ofgem takes account of input from local communities and extensive technical assessments, as well as the economic modelling. Pearse Murray, SP Energy Networks’ Transmission Director said, “The future of electricity generation in Scotland differs now in comparison to what was forecast when we first started planning this upgrade. We don’t want to overbuild, but it is vital that the transmission electricity network in the South West of Scotland is modern, reliable and capable of supporting growth. SP Energy Networks will also publish a consultation report with responses to feedback received on the route corridors within the Reduced Scheme, and the company plans to undertake another round of public consultation in the autumn of this year. Full details of the consultation will be published in advance. -The retention of 132kV as the transmission system for the area. 08.07.16 SPEN’s Plans on the BBC News Website: You can read the coverage here. 07.07.16 Note to Supporters: It has been a quiet period for the campaign. This update email was circulated to supporters. 19.06.16 National Grid’s Role: An interesting piece in The Guardian. We raised concerns about National Grid’s role both with Ofgem early in the year and with Angus MacNeil MP when we met him in Westminster. 10.06.16 Learning from the Danish Experience: Alan Jones embarked on an investigation into the decision by the Danish government to underground their entire High Voltage electricity transmission network. Kv). In the short-term they intend continuing to put 400kV networks overhead (it was a 400 Kv grid that SPEN had proposed for Dumfries and Galloway) but minimise the visual impact using a new tower design – called the Eagle Tower. In the longer term they were to explore the impact of undergrounding 400kV networks. When Alan contacted the Danish equivalent of our National Grid (called Energinet) for more information he learned that, following a change of government, the policy of undergrounding has been suspended. It is worth noting that the Eagle tower may result in access issues. Scottish Power raised concerns about the T design (which is being trialled in the UK) saying that there would be a need for access for a lift alongside the tower route to allow for maintenance. It seems likely that they would raise similar concerns with the Eagle design. 07.06.16 Ministerial Statement: We have been attempting to find out more about the Scottish Government’s energy strategy. This is bound to have a bearing on the way that the government and the Energy Minister will view any proposal from SPEN. In enquiring about this, we were directed to the Ministerial Statement and subsequent questions and answers from the parliamentary business of 15 March 2016. Elaine Murray MSP (then the Constituency MSP for Dumfriesshire) asked a question relating to the SPEN proposal for Dumfries and Galloway and the Minister replied. We are concerned that he misses the point in his reply as, while we understand and appreciate some grid infrastructure may be needed, what we question is the form, shape and scale of the end product. The need for mitigation and the views of local communities in caring for their environments are completely overlooked. We were heartened that there is an intention to embark on a “public dialogue with Scottish communities and energy consumers over their energy future”. We are keen to be part of this dialogue and to ensure that this is a genuine process and not just “lip service”. We will be speaking to our elected representatives to make sure that there is detailed dialogue with communities and consumers (including DGAP!). If you have any comments on the Ministerial Statement, please send them to us at no2plons@gmail.com. 02.06.16 National Park Pledge: During a recent “Candidate Cafe” in Dunscore ahead of the recent Holyrood elections, William Crawford (who is a member of the DGAP committee) took the opportunity to ask the candidates present if they would sign a pledge to support the creation of a National Park in South West Scotland. This is a separate campaign from DGAP (and very long-term one) but a National Park would have a very significant impact on any proposals for pylons or sub-stations. All candidates signed William’s pledge. Three are now MSPs (Oliver Mundell, Joan McAlpine and Colin Smyth). 25.05.16 Lake District Battle There is a battle very similar to ours going on in the Lake District. There is a piece on the BBC News website. It is worth watching especially as it shows a representation of the size and scale of the pylons proposed (both there and here). 22.05.16 Newsletter: The latest edition of the DGAP newsletter is out. You can read it here. 13.05.16 Pylon Item on Radio 4’s PM Programme: There was a short piece about pylons planned for the Lake District on BBC Radio 4’s PM this afternoon. You can listen again here. The item starts at around 23 minutes. 06.05.16 Meeting with Ofgem and subsequent communication: On 11 March 2016 Alan Jones (Chair of DGAP) along with representatives of other interested local groups and Joan McAlpine MSP met several senior managers from Ofgem. The meeting was to explain the position of the various groups that were (and continue to be) concerned by SPEN’s plans. Following the meeting, Alan has had considerable communication with Mike Leonard, Ofgem’s External Relations and Senior Communications Manager about the whole process, Ofgem’s role and the way that a group like ours can have input into the process. You can read the points made at the meeting and the subsequent email exchange (so far) here. 19.04.16 Meeting with David Mundell MP: Members of the DGAP committee met with David Mundell MP to update him on the meeting with Angus MacNeill, Chairman of the Energy Select Committee and to discuss various other issues. Notes of the meeting can be read here. 16.04.16 Meetings at Westminster: Three members of the DGAP committee travelled to London to take our message to Angus MacNeil, Chairman of the Energy Select Committee. They also met local MP Richard Arkless. We will post notes from the meetings here soon. 14.04.16 Newsletter is published: The latest edition of the DGAP newsletter is available here. 13.04.16 DGAP Research Proposal: There is very little information available on the impact of large-scale electrical infrastructure on a region such as Dumfries and Galloway. There should be robust evidence on this and so we have drafted a research proposal to investigate this. 02.04.16 Forum set-up halted – The Scottish Government was planning to set up a Community Liaison Forum (probably including DGAP). This has been stopped and the existing stakeholder group will not meet while SPEN are reviewing their proposals. You can see more about this on Joan McAlpine’s website. 25.03.16 Tynron Community Council becomes the 59th to agree to the joint objection. 25.03.16 The news about National Grid’s conclusion relating to SPEN’s plans has appeared in both the Standard and the Courier. 23.03.16 National Grid has concluded that SPEN’s electrical transmission infrastructure plans for Dumfries & Galloway are not economically viable at this time! The report gives Transmission Owners such as Scottish Power (Scottish Power Transmission Ltd in the report) feedback on their proposals, proposes options that may not have been considered, identifies the preferred option and determines whether it is cost effective. Here is a quote from page 64 of the document: “The Dumfries and Galloway reinforcement option (Auchencrosh to Harker) was not taken to the next stage of evaluation as other reinforcement options were found to be more economic in reducing constraints …”. SPEN’s Strategic Reinforcement proposal for Dumfries & Galloway was therefore considered uneconomic at this stage compared to other options that exist! This does not mean the proposal will disappear. It will be reviewed annually against other proposals and go through a similar assessment process each time. SPEN will still prepare and submit the “Initial Needs Case” to Ofgem who will take account of National Grid’s assessment. This is a sensible outcome! It is, however, not the end of the campaign as there is still a need to replace parts of the aging network and upgrade the system to cope with renewable generation as well as address the issues surrounding the Moyle Interconnector to Northern Ireland. What it does mean though is that we may see several smaller projects being put forward to deal with these specific requirements rather than a single, new super-grid. Be assured that we at Dumgal Against Pylons are pressing for an urgent meeting with Scottish Power to explore the implications of this announcement. 20.03.16 The map showing Community Councils that have agreed to our objection to SPEN’s plans has been updated. You can see the current plan on the Community Council Page. 20.03.16 Lyndsey Ward has sent us a further article from the Inverness Courier describing how, now the Balblair substation is operational, it is being extended. Read what the local Community Council chair thinks of the situation Inverness Courier – Balblair Substation. 19.03.16 Jill Corlett sent in a press release describing how Albert Owen MP, met with Dermot Nolan, CEO of Ofgem and members of his staff on Anglesey recently to express concerns for the proposal calling for new electrical transmission infrastructure. You can read the article here. 17.03.16 New Luce Community Council becomes the 58th to support our objection. 12.03.16 Lincluden Community Council joins the list CCs supporting our objection. That is 57 now on the list. 12.03.16 “Out of Doors” this morning on BBC Radio Scotland included a piece on the campaign with Alan Jones, Barbara Kelly and Kath Aitken interviewed by Mark Stephen. The piece is about 39 minutes into the programme. 08.03.16 Irongray Community Council has agreed to our letter of objection. That is now 56 Community Councils that have agreed so far. See more here. 08.03.16 We have had yet another letter from a Beauly resident about life after pylons. Once again, well worth hearing first hand about what could be coming to this region. You can read his letter here. 08.03.16 Mark Stephen from Radio Scotland’s “Out of Doors” met Alan Jones, Barbara Kelly and Kath Aitken at Clatteringshaws to talk about the campaign. Listen on Saturdays from 6:30 am (it might be on this Saturday or possibly the following one). 07.03.16 The latest DGAP Newsletter is out. You can read it here. 04.03.16 We have received a letter from a second resident who lives in the Beauly area. It is worth reading! 03.03.16 Have you signed the petition created by Kirkmahoe Residents Against Pylons? If not, click here. 02.03.16 There is a photographic competition running at the moment at the eastern end of SPEN’s proposed corridor. Through the competition, the organisers are hoping to create a collection of images showing unspoiled landscape. The competition was launched early February and will run until 1st May, following this there will be a prize-giving evening once the judges have decided on their favourite photos. There is a junior and senior section with first prize being £500 2nd £300 and 3rd £200, there is also a special prize for the best photo taken by a child of school age. The only restriction is that the images must be taken in Zone 6b of the proposed corridor (see the link below – it is the section from the border to Harker), other than that you can include anything you come across so let your creative mind run. To enter please send a hard copy of the photograph no smaller than a postcard to Beat The Pylons, Netherby Hall, Longtown, CA6 5PR. 02.03.16 In today’s D&G Standard reasonable summary of the situation (although it is actually 55 Community Councils – not 35). 28.02.16 Southerness Community Council joins the list of objectors. That makes an impressive 55 so far. 28.02.16 There is in article in today’s Scottish Sunday Express. A little overstating with “joy” and “shelved”. 27.02.16 You may have noticed that the header photos on this website have improved. This is thanks to John Pearson of Images to Cherish who has taken some great photos around Dumfries and Galloway (most are in or near the proposed “corridor”) and arranged them to fit. You can see more of John’s work at: http://www.images2cherish.co.uk. 27.02.16 Good ITV coverage of SPEN’s pause for thought. A general piece here and one about Joan McAlpine’s thoughts on it here. 26.02.16 Not only has SPEN announced a delay in the D & G project but there have been two other Scottish pylon projects where there has been a delay or withdrawal. A project in Ardross is being delayed and another (Blackhillock – Bairingone) has been withdrawn. 26.02.16 The BBC has picked up the news of SPEN’s delay. You can see the article here. 25.02.16 Port William Community Council joins our list. The 54th to agree to our letter of objection. You can see the full list here. 24.02.16 Another Community Council has confirmed that they support our letter of objection to SPEN’s plans. Kirkcudbright is the 53rd Community Council to do so. You can see more about the letter of objection here. 24.02.16 We have had a detailed response to the letter that Alan Jones (DGAP Chair) sent to Ofgem. You can read their response here. 21.02.16 There is a piece in today’s Scotland on Sunday on Green Tourism and how it will be damaged by the pylon plan. You can read it here. You can read the plan here. 19.02.16 There was a piece on the Border News this evening. You can see a snippet here. Well done to the hardy supporters that turned out in the wind and rain to hold the banners! 18.02.16 We are soon to meet Ofgem to raise concerns about the process. You can get an indication of the matters that we will be raising in this letter to Ofgem. 17.02.16 Bizarrely, there are plans to remove pylons from scenic areas while plans proceed to erect them here. You can read about this here. Thanks to Gill Corlett for spotting this and to Alice Howdell for bringing it to our attention. 17.02.16 Do read Deborah Galbraith’s post about D & G winning the Countryfile award for Holiday Destination of the year. 15.02.16 We have published our alternative to SPEN’s plans without the damaging consequences. Tune in to Radio Scotland tomorrow to hear Alan Jones talking about our alternative. See more about the plans here. 13.02.16 DGAP committee members met with Dr Carol Hill of the Crichton Institute last week to discuss their interest in engaging with our proposed research project to evaluate the degree of any positive or negative impacts from the proposal to erect a large, super-grid, electricity transmission network through the region. They are very interested in this proposal. 13.02.16 Members of the DGAP committee had a meeting with Richard Arkless MP last week. The meeting covered a wide range of topics including him agreeing to contact SPEN to express displeasure at the delay in producing a response to the first round of consultation; support for our inclusion on the Stakeholder Liaison Group; facilitating a meeting with Ofgem and discussion of the impact of SPEN’s plans on the low carbon status of the region. 12.02.16 Zabby Allen won our competition to design a logo for Dumgal Against Pylons. The photo below shows Alan Jones, DGAP chair, presenting Zabby with her prize. You will see Zabby’s logo appearing on DGAP literature. 12.02.16 Dumfries and Galloway has been named as Countryfile Magazine Holiday Destination of the Year 2015 / 2016. One has to wonder how this would have gone if we had a string of massive pylons and sub-stations across the region. You can see the result here. 09.02.16 Twynholm became the 52nd Community Council to agree to our objection to SPEN’s plans. You can read the details of the objection here. 07.02.16 There were many articles in the local press about SPEN delaying their response to the first round of consultation. There is a selection here. 07.02.16 A group of residents from Racks near Dumfries met with Joan McAlpine MSP to raise concerns about the proposed sub-station in their area. There is a piece about their visit in DnG24 and papers here. 04.02.16 SPEN delayed their response to the first round of consultation to the end of January. It has still not been published. Our views on this further delay has started to appear in local and national papers including the Daily Record. 02.02.16 Good news! Joan McAlpine announced today that Ofgem have agreed to a meeting with a few of her constituents (DGAP is invited). This will allow us to put our concerns about SPEN and their proposals direct to the regulator. You can read her blog here. 28.01.16 For anyone living in the vicinity of one of the substations planned for Racks, Dalry or Newton Stewart they need to be aware of the health and loss of well-being issues that have plagued the people living nearby the substation at Beauly. Read about it here. 26.01.16 Residents of Racks near Dumfries met with Joan McAlpine MSP to raise concerns about the massive substation planned for their area. You can read about the meeting here. 25.01.16 There was a piece in yesterday’s Sunday Express. You can read it here: Sunday Express. 25.01.16 Members of the DGAP committee met with representatives of Wigtownshire Chamber of Commerce. You can read the notes of the meeting here. 23.01.16 There is a great piece in today’s Herald. You can read it here. 22.01.16 Members of the DGAP committee have had meetings with several people and organisations recently. You can read the notes of the meeting with Aileen McLeod MSP and with D & G Chamber of Commerce. 22.01.16 The letter from Beauly appeared in the Dumfries Standard today along with a massive photo of a pylon. 21.01.16 If you wonder what the pylons and substations might look like, the newly-installed Beauly – Denny line from the Inverness area to the Glasgow area will give you a very good idea. There are some photos here. 21.01.16 The Energy Bill is progressing through Parliament with the 2nd reading on the 18 January. You can read the transcript of the proceedings here (about 3/4 of the way through under Column 149 with the reading beginning at 4.30pm). The Energy Bill includes several issues relevant to this campaign. The House of Commons Public Bill Committee has several meetings scheduled and allows for written submissions from members of the public and, if you would like to make a submission follow this link. 18.01.16 We received a letter from a resident of Beauly about the impact of the pylons, lines and substation. It offers first-hand experience of the impact of living in the region of a substation and overhead lines – similar in scale to those planned for this area. 11.01.16 The minutes of the latest “Dumfries and Galloway Stategic Reinforcement Stakeholder Liaison Group” meeting are on the Government website. This is a group that includes representatives from SPEN and other organisations (including D & G Council) with an interest in the project. 11.01.16 The news of Dame Barbara’s new role is reported in the Annandale Observer. You can read it here. 09.01.16 We are delighted that Dame Barbara Kelly has agreed to join Dumgal Against Pylons as our President! Barbara brings a much experience, knowledge and wisdom to our group. She has a great interest in local matters and is a main board member of Scottish Natural Heritage, founding member of Rural Forum and the Southern Uplands Partnership and is currently chairman of Dumfries and Galloway Arts Festival, The Robertson Trust, the Peter Pan Moat Brae Trust and Convenor of the Crichton Foundation. She commented: “I am deeply concerned that this is not just about the impact of a new transmission line, major intrusion though it will be. What is at stake is the whole future of the region. We urgently need a debate about the underlying issues and the options to which they give rise.” You can see the press release about Dame Barbara becoming our President here. 08.01.16 There was an interesting decision by the Secretary of State for Energy and Climate Change to an application to install an overhead line (actually relatively small compared to the line proposed for D & G). Part of the reason to refuse the proposal is: “there would be major adverse landscape and visual effects were the proposed Development to be consented, and that substantial harm may be caused to cultural heritage assets”. You can read the whole document here. Sections of particular interest include: 4.10, 4.14, 4.19, 4.21 and 11.2. 06.01.16 Dumfries and Galloway has been nominated for Holiday Destination of the Year in Countryfile magazine. You can vote at this link. We do wonder if the region would have been nominated if there was a line of massive pylons and substations in some of the most beautiful areas. 28.12.15 Scottish Natural Heritage published a report last year about the “visual influences” on Scotland’s landscape. These include roads, bridges, built up areas, wind turbines and, of course, overhead lines. You can read the report here. The report includes a map showing the number of “components” visible from any spot in Scotland. You can see that there are few areas in Dumfries and Galloway where no “built development” can be seen. The proposed SPEN corridor crosses some of these areas. 21.12.15 We missed the letter that Morag Youd wrote to the D & G Standard in September so here it is: “Say No To Pylons”. We want these pylons out! 21.12.15 The Beauly – Denny line is now operational and there have been several press items about this. You can read the article on the BBC News website here. Apart from the pylons, it is worth having a look at the photos that show the size of the substations. They are enormous! New substations are planned for Auchencrosh, Newton Stewart, New Galloway and Racks near Dumfries. You can also hear a piece on “Good Morning Scotland” this morning here. It starts at about 1 hour and 50 minutes in. 19.12.15 Ofgem will play a critical role in the process Here is a slide presentation showing the likely sequence of future events in the development of SPENs Strategic Wider Works project. You will note the important role that Ofgem will play in the process in both limiting the cost SPEN can recover as well as deciding if this project goes out to tender. Roles and Responsibilities. 17.12.15 There is a short report on the BBC News website about SPEN delaying the response to the first round of consultation. You can see the report here. 16.12.15 Representatives of DGAP recently met with Colin Gibson, who is a former director of National Grid and advises the John Muir Trust on technical issues. You can see the notes of the meeting here. 16.12.15 SPEN has delayed publication of their report on the first round of consultation until January. You can read their explanation here. 10.12.15 The November DGAP Newsletter is out and can be read here. 10.12.15 There was a really positive outcome to the D & G Council Planning Applications Committee yesterday. They agreed to submit several comments to SPEN as part of the Phase 1 Consultation such as: “With regard to the above, the Council expect SPEN to adopt all possible mitigation to avoid any adverse impact on the region’s sensitive landscape areas, including undergrounding and other routeing options, such as undersea routeing.” Alan Jones, DGAP Chair commented: “This decision sends a very strong signal to SPEN that the people of Dumfries & Galloway are not prepared to see their region blighted by overhead lines and substations and are demanding that SPEN consider alternatives.” You can read the full list of seven comments here. 09.12.15 There is an article on the BBC news website about the report by council officials for the Planning Applications Committee. The report includes several strong statements such as: “They also want the firm to comment on a proposal for an undersea connection between Auchencrosh and the north-west of England.” You can read the article here. 09.12.15 Please join DGAP. Membership is just £5 for the life of the campaign and members can attend and vote at all general meetings. For details of how to join, vist our join us page. locations”. You can read the minutes here. 05.12.15 Joan McAlpine MSP wrote to Fergus Ewing MSP, Minister for Business, Energy and Tourism, with concerns about SPEN’s plans and the Stakeholder Liaison Group. You can read his reply here. 05.12.15 DGAP representatives met with a similar group, Power Without Pylons – www.powerwithoutpylons.org.uk – to discuss the many areas of shared interest. You can read the notes of the meeting here. 04.12.15 David Mundell MP for Dumfriesshire, Clydesdale & Tweeddale and Rory Stewart, MP for Penrith and the Border met met Frank Mitchell, the CEO of Scottish Power to discuss SPEN’s proposal in this region. You can read Mr Mitchell’s letter addressing points raised below. You can also read our response to his letter here. 04.12.15 The article is on the Galloway News website. You can read it here. 03.12.15 A piece in the Dumfries Standard about the calendars given to the councillors. 03.12.15 There is a D & G Planning Applications Committee Report about SPEN’s proposal on the Council website. We are pleased to see that the report reflects several of our concerns. You can read the report here. 30.11.15 We received the following letter from Mark Graham in Kendal. We used to drive through this area on our way to Portpatrick. Looking back we spent six holidays in this area. The last time we drove from east of Stranraer to Portpatrick we were horrified by the number of wind turbines installed. Even worse we now learn there are plans for more east of Wigton and north of Portpatrick. If that wasn’t bad enough we see there are plans to erect new huge pylons in Dumfries and Galloway. I wrote to the SNP Minister for Tourism informing him we WON’T be going back again. If we want to see industrial landscapes we will spend our holidays neaere to home-maybe Manchester or Birmingham! We also drove past new sections of the Beauly Denny pylons.They are so out of place and ugly. Just what is going on in Scotland? Tourism is surely important to you, but if your landscapes are carpeted with pylons and wind farms why bother going? If you know of others with similar sentiments, encourage them to write to MPs, MSPs and Councillors (and with a copy to us please at no2pylons@gmail.com). 27.11.15 There is a piece in today’s Dumfries Courier about the calendars and the visit by the John Muir Trust. 27.11.15 We handed over Unspoiled Dumfries and Galloway calendars to all the Dumfries and Galloway councillors today. We had a media event on the steps of the council offices in Dumfries and the calendars were received by several councillors. Watch out for articles in the local press and on ITV. The picture shows Barbara Webb, the force behind the calendar, with Councillor Andrew Wood. 27.11.15 There was a meeting today to discuss a walk along the pylon route. The thinking is that next summer there will be two walkers or groups of walkers starting at either end of the route and (three or four days later) they will meet up at a central point. There would be the possibility of media interest and a chance to generate interest all along the route. Walkers could join in for a short or long section. If you are interested in getting involved in either the organisation or actually walking, please email no2pylons@gmail.com. 26.11.15 Please join us when we hand in Dumfries and Galloway Unspoiled calendars to all the Dumfries and Galloway councillors at the Council Offices in English Street, Dumfries tomorrow at 3:00 pm. There will be press photographers and ITV present. 26.11.15 Representatives from DGAP met with the Dumfries and Galloway planning officials and several elected representatives in early November to discuss SPEN’s proposals and other related matters. You can read the minutes of the meeting here. 24.11.15 The main delivery of Dumfries and Galloway Unspoiled calendars has arrived. To order them please email Barbara on webb473@btinternet.com or call her on 01848 332554 or email no2pylons@gmail.com with your name, address, email address and quantity required. You can see a short video showing one of the calendars. 22.11.15 We recently met with the Scottish Campaign for National Parks. You can read the notes from the meeting here. 22.11.15 Amber Rudd MP, Secretary of State for Energy and Climate Change, gave a speech to the Institution of Civil Engineers in London on Wednesday. It summarises the government’s policy on the direction of energy policy. You can read it here. 20.11.15 If you would like to know what the calendar looks like, have a look at this short video. You can see it here. You can order calendars by phoning Barbara on 01848 332554 or email her on webb473@btinternet.com or email no2pylons@gmail.com. 20.11.15 If you have not joined Dumgal Against Pylons, please do so. It is £5 for the duration of the campaign. Make cheque (£5 per person) payable to Dumgal Against Pylons and send them to: Penny Coles, East Manse, Auldgirth, Dumfries, DG2 0RY. Please include your address and email address and Penny will acknowledge your membership and we will keep you updated with campaign information. 20.11.15 If you would like to listen to what was said at the D & G Council Economy, Environment and Infrastructure Committee when they considered SPEN’s proposal, you can hear it at this link. It was item 11 on the agenda and starts at 1.05.38. 19.11.15 You can see some of the text content of the Dumfries and Galloway Unspoiled by clicking here. To order calendars please email Barbara on webb473@btinternet.com or call her on 01848 332554 or email no2pylons@gmail.com with your name, address, email address and quantity required. 18.11.15 We met representatives of the John Muir Trust yesterday and showed them some of the region that could be damaged by SPEN’s plans. You can see more about the trust at: www.johnmuirtrust.org. 17.11.15 Back on 8th October, you will find the following post: “Following a Freedom of Information Request, we now have minutes from three Stakeholder Liaison Group meetings. This is a group which, in addition to representatives from SPEN, includes SNH, SEPA, Heritage Scotland and other decision-making bodies. You can read the minutes here: 21st Feb 2014, 13th March 2015 and 29th April 2015.” Now, after a further Freedom of Information Request, we obtained the documents referred to at these meetings. You can read there here: 1st SLG PP Presentation210214, Potential Study Area, SER_Figure 2.1, SER_Figure 4.2 and SER_Figure 4.5. 16.11.15 The monthly summary for October is now on the website. You can read it here. 15.11.15 Earllier this week, three members of the DGAP committee met with representatives of the Scottish Campaign for National Parks (SCNP). It was noted at the meeting that SPEN would need to adopt a much more sympathetic approach to replacing and reinforcing the existing infrastructure in a National Park. There could also be benefits for Dumfries as the gateway to the region and the increase in visitor numbers would help boost the local economy across the region. You can read the meeting notes here. 15.11.15 Ofgem has just reported that SPEN failed to achieve the standard set by Environmental Discretionary Reward Scheme (EDR). The purpose of the EDR scheme is to “sharpen the companies’ focus on strategic environmental considerations and organisational and cultural changes to facilitate growth in low carbon energy”. It came last of the three applicants. One of the assessment categories is: “Network development solutions that avoid the need to reinforce the network”. You can read the letter setting out the decision here. 14.11.15 The 50th Community Council has signed up to the DGAP objection to SPEN’s plans. This means that all the Community Councils along SPEN’s proposed route have now signed our objection. This is a very strong message to SPEN and also to our Dumfries and Galloway Councillors and other elected representatives. 13.11.15 How many pylons would there be along the 175 km route proposed by SPEN? The spacing would be big – because the pylons are so big – around 300-350 m. This would mean that there would be about 500 pylons. Each leg of each pylon would have about 25 tonnes of concrete ballast. That is around 50,000 tonnes for the pylons (more for the sub-stations, access roads etc.). Thanks to Barbara and Doug for raising this question. 11.11.15 The next organisation in our targeted campaign is the Forestry Commission Scotland. You can see more about this and a template email here. Dumfries and Galloway councillors met today to discuss the Council response to Scottish Power Energy Networks (SPEN) proposal to install high voltage power lines and pylons across 175 kilometres of the region. There have been objections from 49 Community Councils as well as from many residents and other concerned organisations, and Councillors today acknowledged the high level of concern from their constituents. Members of the Energy, Environment and Infrastructure Committee agreed to hold a number of private seminars devoted wholly to SPEN’s proposals. The first of these will take place prior to a further hearing at the Planning Applications Committee scheduled for early December. 10.11.15 The “Unspoiled Dumfries and Galloway” calendar will be out in the next few days. Details of how to obtain copies will be circulated in the next few days. 9.11.15 Ahead of tomorrow’s D & G Council meeting (see the post below), Alan Jones, Chair of DGAP, has written to Councillor Nicholson and copied in all of the Councillors on the Economy, Environment and Infrastructure Committee to state DGAP’s great concern at the apparent proposed stance of the committee. You can read the text of his email here. 9.11.15 A few people have asked whether members of the public can attend the D & G Council meeting tomorrow. As we understand, it is OK to attend but not to speak. It sounds like there will be quite a few people there. You can see the agenda here (the SPEN item is 11 on the agenda). The meeting starts at 10:30 am. 9.11.15 Caerlaverock Community Council has joined 48 other CCs in adding their name to our objection to SPEN’s plans. You can see the full list of Community Councils that have signed up to our objection here. 9.11.15 There is an important meeting of the Dumfries and Galloway Council Economy, Environment and Infrastructure Committee tomorrow. Several people have contacted D & G Councillors to express concern about the guidance that they have been given and the stance that they may be taking. You can see examples of their emails here. 6.11.15 The Galloway Glens is one of three “iconic landscapes” to share in £7.5 million of funding. One has to wonder how “iconic” the region will be if there are 50 m pylons and large substations. You can read the news story here. Thanks to David Howdle for spotting this. 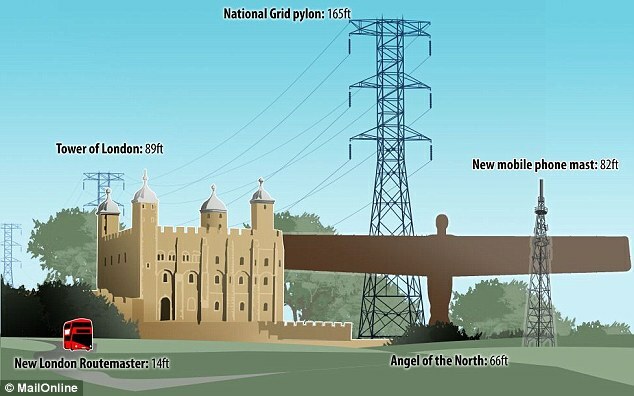 6.11.15 John Pearson created this image to show the scale of the proposed pylons. He added a pylon to the photo of All Saints Church, Church near Newton Stewart. new addititions: Ramblers Scotland and Scottish Campaign for National Parks. 6.11.15 Have a look at the recent Glenkens Gazette. It has a front page article about the pylons and substations and a good piece by the Chair of the Dalry Community Council on page 12. 4.11.15 The Historic Scotland response to the SPEN consultation has been added to the Supportive Statements. What you will find is significantly different to that reported by the BBC. It reminds councillors that if they have previously declared their position they must refrain from voting on the matter at a Planning Applications Committee (if they sit on this committee) but also when the application comes before the whole council – which it will, in due course. In effect this means that roughly half the elected representatives who have declared their position will not be able to participate in this important democratic process. The other aspect of this proposal to be discussed on the 10 November is that at the 2nd and 3rd SPEN consultations the proposals will go before the Planning Applications Committee so that the committee can feedback to SPEN their views and advice on the direction being proposed – but any decision by the PAC will not be binding on SPEN. We would encourage as many people as possible to attend this meeting, which commences at 10.30am, although do not expect to speak but just being present will send an important message. 3.11.15 If you are on Facebook and interested in birds why not go to https://www.facebook.com/BBCSpringwatch and ask a question about high voltage pylons and bird strikes while Autumn Watch is being screened from Caerlaverock. Don’t forget when you post to mention that SPEN are planning this new overhead line on pylons up to 50m tall. I have just posted so why not join me. We may get our message heard if enough of us write in. 30.10.15 If you are unhappy at not receiving a reply from Scottish Ramblers on their failure to object to SPENs proposal why not write to Helen Todd, Campaign and Policy Manager at Scottish Ramblers and tell her so. She can be contacted at helen.todd@ramblers.org.uk or if you wish call her on 0131 4727006. 28.10.15 Following our meeting with Joan McAlpine on the 14 September 2015, Joan has been active on behalf of her constituents with communications to and from Ofgem. Please see below JMcA to Ofgem 22 Sept 15, Ofgem to JMcA 14 Oct 15, JMcA to Ofgem 26 October 15 and Joan McAlpine’s timeline of activity JMcA Timeline. 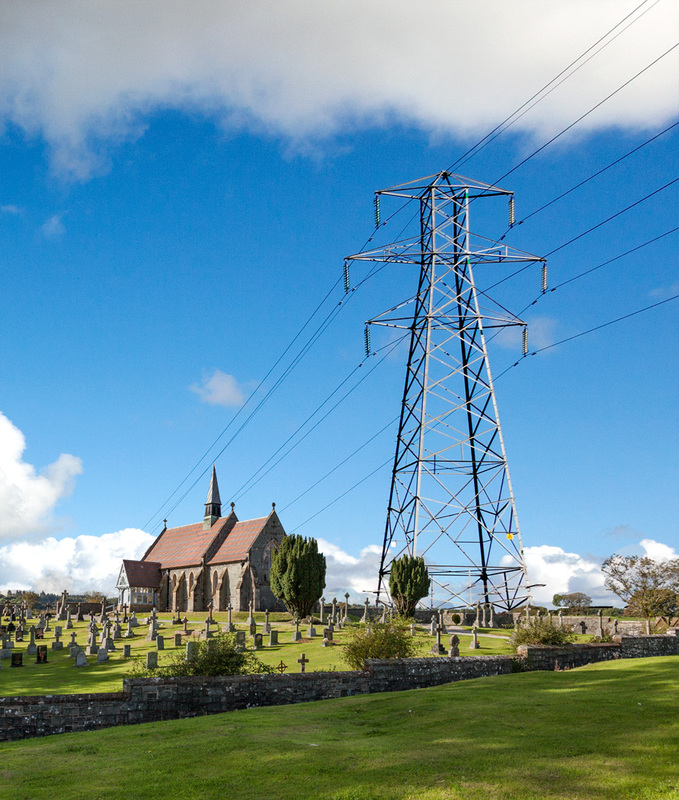 26.10.15 Here is a question: what do Greyfriars Church in Dumfries and one of SPENs 400kV pylons have in common? Answer, they both share a similar height of 146ft or 50m. So next time you are standing in the town centre lift your gaze skyward to the church spire and imagine pylons that tall marching across our beautiful countryside. 23.10.15 The Woodland Trust Scotland has submitted their comments to SPEN with some significant concerns with the following objection: “At present the Woodland Trust objects to the project on the basis of potential for direct loss, damage and fragmentation of large areas of ancient woodland”. You can read their full submission here. Thanks to Barbara Orme for her work on this. 22.10.15 Alan Jones has been interviewed today on West Sound following news that the pylon infrastructure may be installed by a contract company. You should be able to hear the interview some time between 2:00 and 7:00 pm today. 20.10.15 Plans to create a line of pylons in Ireland has been abandoned recently. You can read about it here. 20.10.15 Andy Mackay spotted this article. Surely SPEN will not put up pylons then consult on running the lines underground…! 20.10.15 Colin Nimmo spotted the following article on the BBC website. This could mean that there is even more pressure on companies to opt for the cheapest method. 19.10.15 Concerns are not just about pylons and lines. There are also to be new substations at several points along the line (near Newton Stewart, Racks / Collin and Dalry) and they must be appropriately sited. As with the pylons, these will be massive new sites. To get an idea of the scale of these substations, have a look at this image of a similar one at Harker just north of Carlisle (the proposed line would terminate here). You can see Harker from the air by clicking here and now imagine one of these near Newton Stewart, Racks / Collin and Dalry. 19.10.15 David Mundell MP and Rory Stewart MP (for Carlisle and the Lake District) are meeting Frank Mitchell, Chief Executive of Scottish Power Energy Networks in London this Wednesday evening to put to him concerns on behalf of their joint constituents about SPEN’s plans for the Strategic Reinforcement Project. 17/10/15 The RSPB sumitted a response to the SPEN consultation and raised several significant concerns. You can read their response in the Supportive Statements section. 15/10/15 The government has confirmed how access to the Renewables Obligation (RO) subsidy will be closed to new onshore wind turbines. In general, projects must be accredited by 1 April 2016, a year earlier than was first envisioned. But amendments to the Energy Bill put before parliament on 8 October would establish limited grace periods for projects that have reached critical milestones. This is broadly in line with an announcement made to parliament on 18 June. But the conditions for accessing the grace period are now slightly more generous, a result of government discussion with industry. You can see the wording of the DECC Policy Paper by clicking here. 15/10/15 Our targeted campaign continues. Please write to the Ramblers’ Association. Contact details and a template email can be found at the Tartgeted Campaign section of the website. 14/10/15 Loreburn Community Council has signed up to the objection making 48 so far and accounting for a population of around 70,000 people covered by the community councils that have signed up. 14/10/15 Alan spoke at a meeting at Amisfield yesterday. There were 50 – 60 people there and much interest. If you would like to see the Alan’s PowerPoint presentation, click Presentation. 12/10/15 There are to be three new sub-stations as part of this SPEN plan. One just outside Newton Stewart, one in the Dalry / New Galloway area and one near Racks / Collin. If you want to have an idea what is involved in installing a sub-station and what they might look like, visit: Substation. This is the substation that you see if you go up the Dalveen Pass at Elvanfoot, just before you reach the motorway. 11/10/15 Have a look at the Kirkmahoe No Pylons webpage. There is lots of good information including a really useful visualisation of the size of the pylons. 10/10/15 We are about to select the photos for the calendar. If you have any more to submit, please send them to Barbara by the end of Monday 12 October (her email address is: webb473@btinternet.com). If possible, please send landscape orientation photographs with large, high quality source files. The files could be TIFF or jpeg but we would prefer RAW files if they are available. For selection purposes (and for quick emailing), small files are fine but, if a photo is selected for the calendar, we will need the original large file to work with. As an absolute minimum, the long side of the source file must be 2000 pixels. Please let us know if you have reduced the file size for emailing. In essence, send in any photo that you think might be suitable and it will be considered! If it is not large enough or the wrong orientation, we’ll just put it to one side. John will carry out any retouching to improve the selected photos and will be happy to supply the retouched files to the owners. 8/10/15 The John Muir Trust has added a page to their website about SPEN’s plans. You can see it here. On the JMT webpage, you will see a photo illustrating a 132 Kv pylon and a 400 Kv pylon. It is the 400 Kv pylons that are destined for this area! 8/10/15 Following a Freedom of Information Request, we now have minutes from three Stakeholder Liaison Group meetings. This is a group which, in addition to representatives from SPEN, includes SNH, SEPA, Heritage Scotland and other decision-making bodies. You can read the minutes here: 21st Feb 2014, 13th March 2015 and 29th April 2015. 8/10/15 Can you offer any help with the campaign? We will need people to man events, create fliers (and hand them out), take part in publicity events, offer financial help and more. If you might be able to offer help in any way or have particular skills that might be useful, could you email Matthew at no2pylons@gmail.com? Matthew will collate a volunteers list. Please also get in touch if you have any questions, ideas or suggestions. 8/10/15 Dumgal Against Pylons is now an unincorporated body. There is more about this and who’s who in the About Us page. 7/10/15 You may have seen photos recently of pylons in the shape of “giants”. Have a look at www.choishine.com/Projects/giants.html. Andi Holmes from Dalry (and possibly others) wondered if, where pylons have to be installed, these could be a possible tourist attraction. Alan has done some checking with the architects and you can see the questions and answers here. In summary, none has been constructed yet but they hope to have some in Iceland in 2017. They are more expensive than standard pylons, the design should allow maintenance and several EU operators have shown interest. We do not see this as an alternative to running cables underground or through the sea but, where there is no other option, these might be worth consideration although there is likely to be a range of views on this design. **6/10/15 There were a couple of items in the Dumfries Courier of 2 October. “Calls for Ofgem to Fund Underground Power Line” with a story about Joan MacAlpine MSP writing to Ofgem to ask them to fund undergrounding of the line after meeting Dumgal Against Pylons! The second is Elaine Murray MSP’s “Holyrood Diary” where she mentions being in regular contact with SPEN having had a “very informative” meeting with Dumgal Against Pylons who presented “very well thought through alternatives” which she intends to put to SPEN when she meets them next month. **5/10/15 We are making good progress with the calendar to show the beauty of the countryside that SPEN plans to destroy with pylons and substations. We are gathering photos from along the “corridor”. Do you have or could you take a photo from somewhere near you? It needs to be good quality and high resolution (the photos will be A4 size in the calendar). It could show a local scene, a landmark or a place of interest. Please send photos to Barbara at webb473@btinternet.com. Thanks. We plan to give a copy to elected representatives and a copy to SPEN. Additional copies will be available for sale. Please let Barbara know if you think that you might buy a copy (or several copies) so that we know how many to print. **2/10/15 Have a look at this little video of Burswark Hill (near Waterbeck) which is just north of the corridor. One of the many ancient historic sites that would be damaged by the proposed pylon route Burnswark Video. **1/10/15 The latest organisation in our targeted campaign is Friends of the Earth Scotland. For details of how to contact them and what to say click here. **28/9/15 We are making a calendar to show unspoiled Dumfries and Galloway – without any pylons and sub-stations. If you have any photos from along the “corridor” that might be used in the calendar (or you could take a photo) please let Barbara Webb know at webb473@btinternet.com. If you have any skills that might be helpful in putting the calendar together, could you also let Barbara know? Thanks. **24/9/15 The John Muir Trust has also responded to SPEN’s proposals. This is well worth reading – by clicking here. **24/9/15 Do read the John Muir Trust response to the proposed line and pylons in the north west of England. It is a few pages long but well worth the time. If you don’t have time to read the whole thing, there are a few highlights here. **23/9/15 Several people who petitioned Scottish Natural Heritage have now received a reply as follows SNH Response together with a copy of SNHs response to SPENs consultation Response bySNH to consultation over preferred corridor 31 August 2015 It is at least some small measure of comfort to see their reply acknowledges the need to underground in certain areas. ** 21/9/15 William Crawford, Penny Coles and Alan Jones met Joan McAlpine, MSP last Monday to discuss concerns arising from SPEs proposals. A copy of the minutes can be found here Meeting with Joan McAlpine. Since the meeting Joan has actioned the points raised and written to Fergus Ewing Joan McAlpine to Fergus Ewing, Ofgem Joan McAlpine to Ofgem and to Scottish Power Joan McAlpine to Scottish Power. We think you will find they all make interesting reading and provide the level of support that encourages us to keep moving forward. Please circulate. ** 10/9/15 Letter templates added to petition the Chair (Ian Ross) and the Deputy Chair (Sue Walker) of Scottish National Heritage. ** 6/9/15 New web page called Targeted Campaign containing letter templates to send to organisations that in turn will pressure SPEN. Please use and ask your friends, relatives and neighbours to complete and send too. ** 5/9/15 Yda Morgan is proposing a group walk along the route SPEN plan to take with the pylons in order to obtain more publicity. If anyone is interested email Yda at yda@morganbellows.co.uk. ** 5/9/15 Deborah Galbraith informs us of plans to release a pair of breeding Golden Eagles in the Galloway Forest Park (SPENs Zone 2); more reason to underground cables! ** 5/9/15 SPEN are at it in Wales too. See: http://www.rhyljournal.co.uk/news/139927/protestors-march-to-make-voices-heard-on-pylons.aspx The only difference is they have their Council fully behind them. Shame on Dumfries & Galloway Council for not taking a similar stance! Thanks go to notons5@hotmail.com who sent in the news item. ** 4/9/15 Asymmetric protesting: what does it mean for us? See blog page for more information. ** 4/9/15 At least one councillor responds to David Howdle to say they know nothing about the Stakeholder Group but that they will ask around – watch this space for the unfolding story! ** 4/9/15 Watch out for protest letter templates to the British Trust for Ornithology (BTO), the RSB and the Wildfowl and Wetland Trust (WWT). Colin Mitchell will produce information for us so that we can personalise and express our concerns to these organisations. ** 4/9/15 Further suggestions for asymmetric protests from Barbara Orme – Dumfries & Galloway Natural History & Antiquarian Society, Autumn Watch and MOD, and from Alice Howdle – Artists, Art Galleries, craftspeople and those businesses involved in tourism. ** 3/9/15 Gillian Massiah from the Borders Region accuses SPEN of lacking transparency in so far as they do not provide justification of the estimated £16bn constraint payments by 2030 and upon which their proposal is predicated to Ofgem. ** 3/9/15 Penny Coles writes to D&G Council Chief Executive, Gavin Stevenson, requesting a meeting to discuss SPENs proposal and the potential impact on the visual amenity and the tourism industry in the region. ** 2/9/15 BBC News report with a plea to underground SPENs cables through D&G. Sent in by Mary Hollern. ** 2/9/15 ITV News broadcast. SPEN keep re-playing the message that it costs more to underground. We know it does but the alternative of destroying our landscape will cost more! ** 2/9/15 David Howdle discovers from email exchange with Energy & Climate Change Directorate, Scottish Government, that a Stakeholder Liaison Group which includes Dumfries &Galloway Council has met 3 times to discuss this project, the latest being 29 April 2015. Who knew about this? A FOI request has been made for copies of the minutes of these meetings. ** A similar story sent in by David Howdle reporting the interconnector between France and Spain, again undergrounded.